His site, KaijuZoo Toys, offered something great for folks like me: not wanting to deal with the hassel of paint supplies, the mess, worrying about wrecking your vinyl(! ), etc., clients are able to relax and focus on the paint/color scheme of whatever vinyl figure--glow or not--they want painted. John even offers services to remove old/damaged paint jobs prior to restoration or custom work. It's really a very cool service if you think about it. 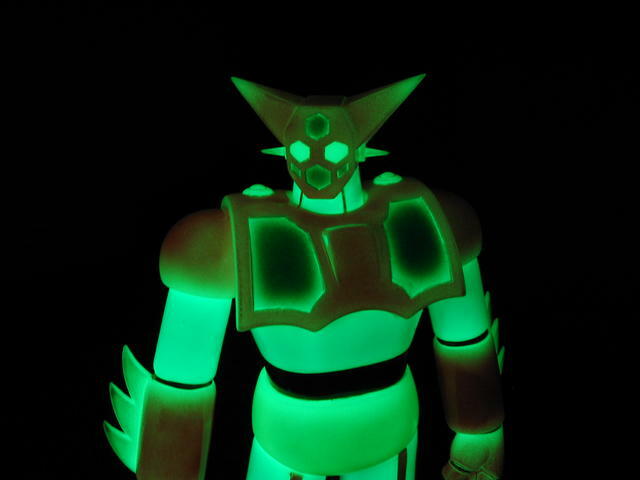 Many vinyl kaiju manufacturers these days release unpainted exclusives of their molds...in glow or varying colors of opaque or translucent vinyl. The thing is that most folks may have no desire whatsoever to paint their own figures. I don't own an airbrush, for example--let alone the space to set one up properly! This is where Jonee comes in! Besides being a great guy to chat about Godzilla and other monsters with, he'll work directly with you via phone or e-mail, and take as long as needed to come up with the perfect paint scheme for your figure. He's an experienced kaiju toy collector, himself, making his feedback in this process invaluable. He's a real fan, a true artist, and it clearly shows in his work. So as a client, I get to sit back, relax, and let my imagination take off. 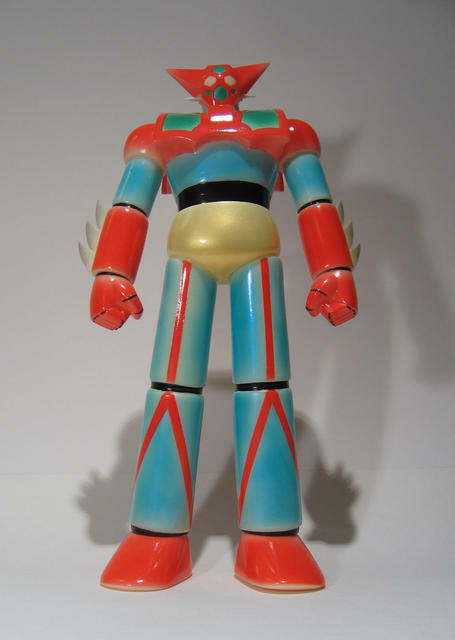 This figure is actually my fourth KaijuZoo custom...and we're even in the process right now of discussing a fifth! 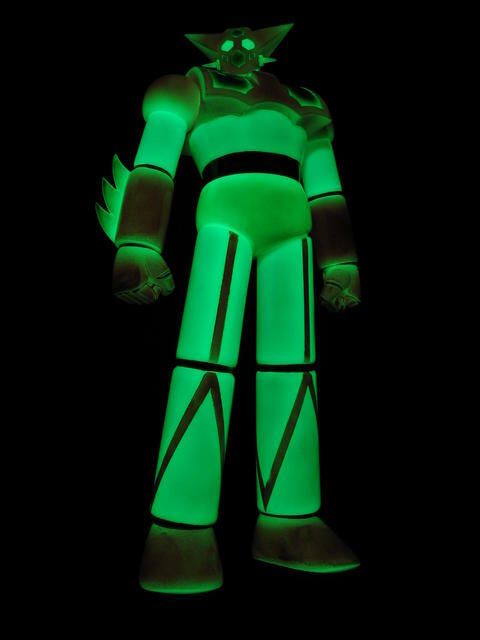 I even do searches now for unpainted (glow) vinyls for anything that catches my eye as something that Jonee can transform into a masterpiece. And that's what led me to this figure. 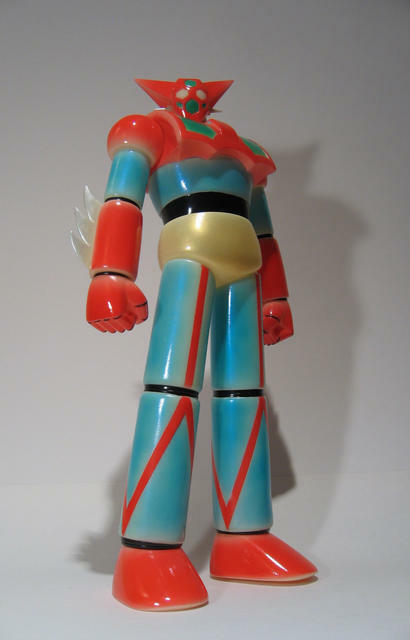 I'd been a pretty big fan of Marmit's Fierce Legend of Super Robots soft vinyl figure line for some time, and I'd already picked up a few over the years. Didn't take long for Jonee and I to work out the color scheme for this guy, either. 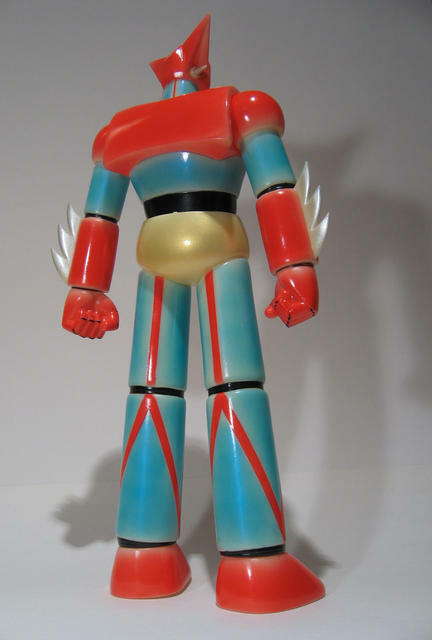 Because of my love for vintage robot toys and the considerable size of this figure (15 inches! 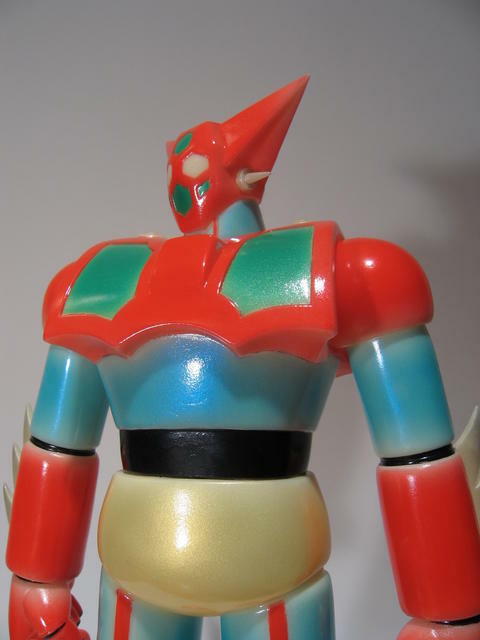 ), we decided on something reminiscent of the 24-inch Getter 1 Jumbo Machinder: pretty much anime-accurate colors except the white parts in the show would be painted light blue. The figure now has a translucent, metallic paint application that really needs to be seen in person to appreciate fully! When looking closely at it, the color density seems to shift subtly as you tilt the figure. Very cool! And the glow really just jumps out of it! The real triumph of this project--something Jonee does amazingly well when it comes to glowies--is the fantastic balance struck between how the figure looks under normal light and in the dark. Whereas many glowies tend to be a little lackluster under normal light in order to maximize the glow effect, this figure identifies itself boldly with its high-contrast metallic red sheen. The characteristic gold of his trunks and green on the chest panels just pop, too, completing the overall look. Not much articulation in these guys...but just enough to add a little heroism! 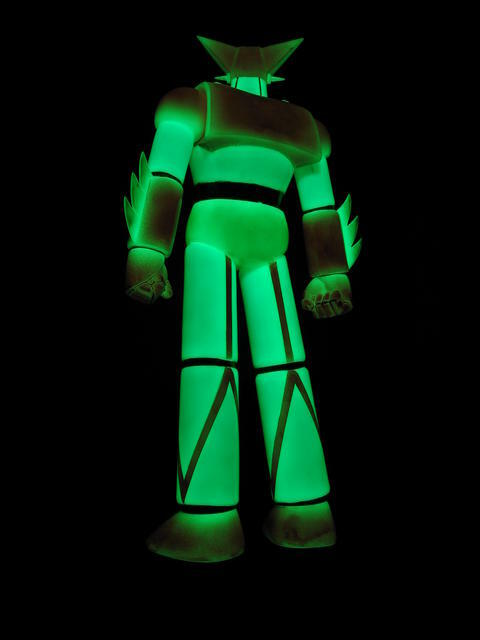 So Jonee's first non-kaiju glowie (unless you count Jet Jaguar, Moguera, and Mechagodzilla!) is clearly a resounding success. ...And now, of course, the good part: the glow pics! 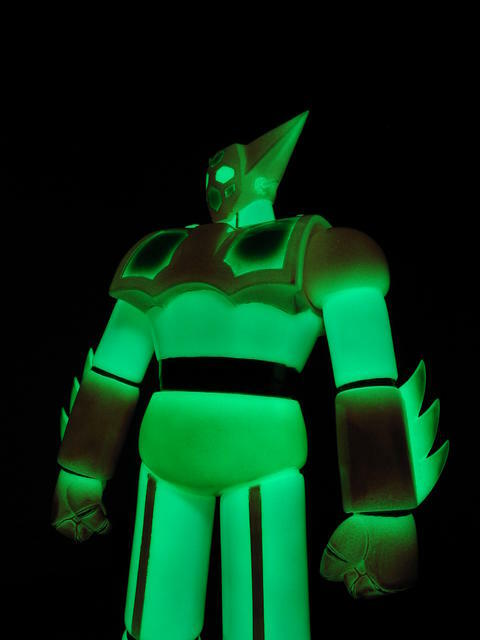 Consider yourselves lucky: I was gonna make some awful crack about the figure "glowing with 'Getter Sen'", but the non-geek side of me won out! That is unbeleivably cool. I'll have to see it sometime in person.